It's no secret that the Penguins find themselves sputtering along late in the season, posting a modest 8-8-2 record since the Olympic break. As a result, with the playoffs barreling down on the club like a freight train, dark clouds of doubt and uncertainty seemingly hang over Western Pennsylvania as ghosts of postseasons past dance in the minds of the Pittsburgh faithful. Rather than focus on all the question marks, concerns or countless calls for the coach's/general manager's/goaltender's/whoever's head, though, we thought we'd explore some reasons to find optimism as the Pens prepare for playoff hockey. No, really; they exist. And, honestly, it didn't even take long to conjure them up. For much of the season, the Penguins persevered through an unholy amount of injuries. Serious ailments to key contributors have robbed Pittsburgh of a healthy lineup for literally the entire campaign. In order to find success, individuals embraced more significant roles (Matt Niskanen), stars were born (Olli Maatta) and minor league call-ups filled in admirably (Brian Gibbons and Jayson Megna). And, with Sidney Crosby and Marc-Andre Fleury leading the way, the Pens overcame their plethora of injuries to run away with the Metropolitan. On the verge of clinching their second consecutive division title, however, the Pens have finally hit a rough patch. Their typically superior special teams are struggling, players appear worn out and the team lacks consistency. Luckily, help is on the way. As Pens Initiative wrote about yesterday, Paul Martin's return appears imminent. What's more, of all the currently injured Penguins, only Pascal Dupuis finds himself lost for the season. The likes of Evgeni Malkin, Joe Vitale and Marcel Goc, however, could all return for the start of the playoffs. Hell, even Kris Letang hasn't been officially ruled out. Thus, if the Penguins can finally escape the injury bug (knock on wood) they could find themselves nearly intact for a postseason run. And, while that won't dispel all the club's deficiencies, it will transform them into a much more formidable opponent. Leading up to last year's trade deadline, Ray Shero was like a kid in a candy store. After acquiring Douglas Murray, Jussi Jokinen and roughly half the captains residing in the Western Conference, an already loaded Pittsburgh squad appeared destined for date with a trip to the Stanley Cup Final. Ultimately, though, the team simply got older. Yes, Jokinen found success, evolving into a versatile contributor who remains with the club. But Murray didn't really fit within the system, Brenden Morrow appeared a step behind in the playoffs and Jarome Iginla never looked comfortable in a Penguins' sweater. In hindsight, perhaps too many moves took place; maybe less could have been more. This year, though, the Penguins yielded a much different return. It could have been a function of the market or maybe it was Shero's lack of salary cap space but, in the end, the Penguins subtly secured depth in lieu of making a big splash. Despite rumors swirling around a potential acquisition of Ryan Kesler, the Penguins brought in Lee Stempniak and Marcel Goc, two separate moves that served to bolster a top-heavy forward unit. For his part, Stempniak has already shown signs of developing chemistry with Crosby and Chris Kunitz, slotting in on the top line in place of the injured Dupuis. Meanwhile, prior to a nasty injury, Goc vastly improved the depth of the team's bottom-six. Most importantly, there isn't a need to put a square peg in a round hole this year. Both acquisitions fill specific needs, addressing previous voids in the Pittsburgh lineup. If and when the Penguins finally get (relatively) healthy, Stempniak and Goc will compliment the club's high-end skill by filling roles that fit each acquisition's particular skill set. It's hard to imagine this Pittsburgh team not finding itself under pressure. After all, employing Crosby, Evgeni Malkin et al begets a need to win. Now. But, outside of the Pittsburgh locker room, who really envisions the Pens parading the Cup around the ice this spring? After all, this is a top-heavy squad that's been consistently decimated by injuries with postseason demons, a team far removed from the one who went an entire calendar month without a loss last year. 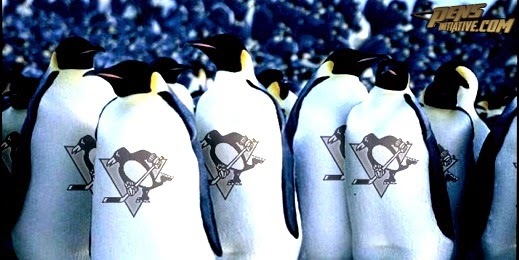 That public persona doesn't bother the Penguins one bit, though. Perhaps there's something to that. Maybe entering the playoffs without people anointing the club as heavy favorites will prove beneficial, serving to foster an "us against the world" mentality. Maybe playing a potential role of underdog will motivate the Penguins to prove themselves, to show that they can still find success in the postseason, that it's someone else's turn to succumb to the pressure. Does that mean it will necessarily happen? Of course, not. But it's something to be optimistic about.